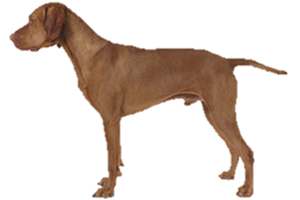 The Vizsla is a pointer, a gundog that has been bred specifically for their ability to point. This means that they will freeze when they have found game and point their muzzle towards the waiting animal to give the hunter its location. They can also easily be trained to retrieve prey once it has been killed. Their traditional hunting grounds are the hot central Hungarian plains called the Puszta. The Vizsla is a Hungarian breed and their name may be taken from the 12th century settlement of Vizsla in Danube Valley, or alternatively be mean 'alert and responsive'. It is believed that its ancestors were the hunting dogs of the Magyar tribes and may have assisted them since the 8th century. Written records naming them date back to the 12th century and the Vienna Chronicle, a 14th century codex, has an entire chapter on hunting with falcons that has an image remarkably close to today's dog. Throughout the years they were jealously garded by the wealthy and aristocrats who kept the bloodline pure, but fell into decline at the importation of both the Pointer and German Shorthaired Pointer. By the 19th century a census revealed that only 12 dogs remained and it has been suggested that in the early 20th century crosses with other pointers was used to save the breed. World War I and II dealt the Vizsla another blow and it was almost completely wiped out in its homeland, this time it was saved by dogs taken into neighboring countries by fleeing refugees. Today the Vizsla is safely established worldwide as a thriving breed. Is the Vizsla Right for You?